Shopping for occupational gifts for electricians, linemen, tower techs, and engineers can be a tough job! Here you can find that really special gift that makes them crack a toothy grin or you can find a truly useful gift, where they will wind up thanking you silently nearly every day of the week! Let gift-giving return to what it really should be -- something fun, honorable, and brimming over with genuine thoughtfulness! Grab a cup of coffee and browse! We thank you or shopping with us! 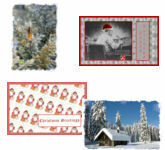 Thank you for shopping our Christmas card and ornament department for Ham Radio Operators and Amateur Radio Operators! 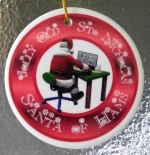 Santa of Hams Christmas Ornament - Cute! Let TNT be your one-stop shop for all your electrical retirement gifts and promotions, lineman rodeo events, safety awards, lineman apprentice and apprentice electrician graduations, lifetime achievements and life celebrations! We are loaded with gifts for electricians and electrical contractors, gift ideas for power linemen, tower technicians, amateur radio operators and electrical engineers! Anyone who works with or STILL plays with electricity!